Intended for camp coordinators with the mission of bringing youth closer to their church, this Christian Camp Registration PDF Template is the perfect tool for managing data. With registration data automatically converted into PDFs camp counselors can easily access, you’ll be able to devote more time to scheduling team-building and worship activities. 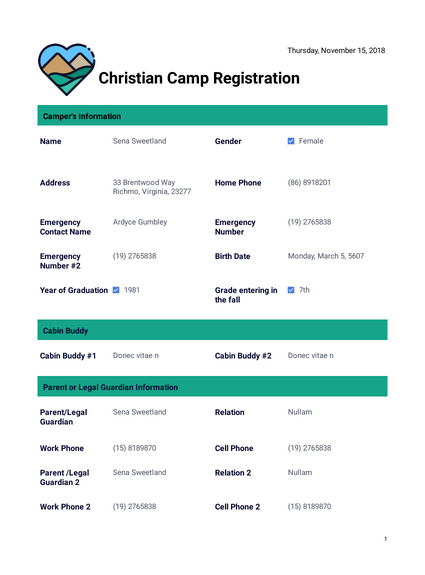 This customizable template includes form fields for campers to provide personal and guardian information, church affiliation, medical history, payment details, and authorized release. JotForm’s PDF Editor gives you the option to rearrange the template layout and attach your camp’s logo with our intuitive drag-and-drop editor. Once finalized, your personalized template will save campers’ registration forms as protected PDFs you can actually have faith in. Collect your online responses with JotForm and turn them into professional, elegant PDFs automatically. Is camper free from infectious desease or conditions? Are immunications up to date? Any activity the camper should be restricted from? Ut tellus. Nulla ut erat id mauris vulputate elementum. Any physical, mental or other condition that would require special attention or medication while at camp? List any past medical treatment that would be helpful for us to know. Duis consequat dui nec nisi volutpat eleifend. Donec ut dolor. Morbi vel lectus in quam fringilla rhoncus. Any dietary needs that we should know about? List all medications, both prescribed and over the counter, all medications will be turned into the health officer except rescue inhalers, bring all medication in original containers. Summer Camp Invoice PDF Template is perfect for collecting enrollment fees for hundreds of campers. After collecting your payments online, you can automatically save all transactions as PDFs using this sample. When organizing summer camp programs, you need to provide as much information as possible about camp rules to parents and guardians. With JotForm’s Summer Camp Parental Consent PDF Template, you can create a personalized and detailed consent form parents will actually want to read. You’ll also be able to save all submitted online responses as PDFs that can easily be downloaded and shared with camp staff. Using JotForm’s PDF Editor, you can rewrite the provided text to better describe your camp’s unique policies and services. No coding skills needed — just drag and drop elements until you’re satisfied with the template layout. Once you’ve finished making modifications, your template will automatically convert any submitted responses into PDFs that will be as safe as your campers. Camper Information PDF Template will instantly transform camper information into secure PDFs that you and your camp staff can pull up at any time, whether during an activity or an emergency.